Salary Survey Methodology – Annual pay for bachelor’s degree graduates without higher degrees. The typical starting graduates have 3 years of work experience, while those in mid-career have 15.5 years. 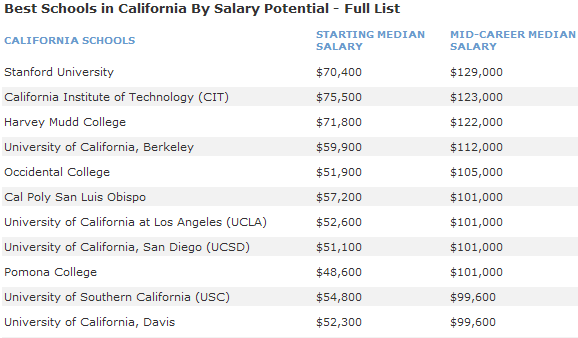 This survey lists the top 10 universities in the State of California based on student’s salaries. The above salary survey was conducted by Payscale.com. Considering the survey results, if you have completed a bachelor’s degree at Stanford University and have 3 years’ work experience, you can expect to earn around $70,400 per year. That figure, though, is a median value. So in reality, graduates from Stanford University should be earning much more than the median value. The starting salary of $70,400 in California is equivalent to around $55,000 in Florida after comparing cost of living, State taxes, and other expenses. This applies to US citizens only. It is tough to get full Time and get sponsored though, but i agreed with Salary range though in general. Nice piece of info here! Thanks ! Similarly, could you please post such info for other States ?